With the 32- bit micorcontrollers becoming popular and also the kits/boards available at affordable prices, we at EE Herald bringing you new modules on embedded systems design practice. 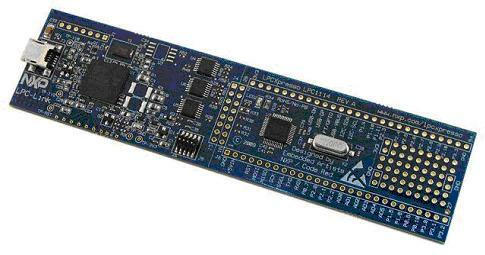 The idea is to provide you the inexpensive 32-bit MCU based latest hardware boards. We have selected ARM Cortex M0 based boards: LPCXpresso development board from NXP Semiconductors and STM32F0 Discovery from ST MIcroelectronics. Both the boards we have suggested here are available in India. Below is the installation and program execution guide with one simpe program for NXP's LPCXpresso board. Hard Disk: 300+ MB of available space. 1. LPCXpresso development board (In the previous module we have provided link to buy this kit). 1. You got to to download the LPCXpresso tool at http://lpcxpresso.code-red-tech.com/LPCXpresso/ by creating your account by providing your email id . 2. Password will be sent to you by e-mail. 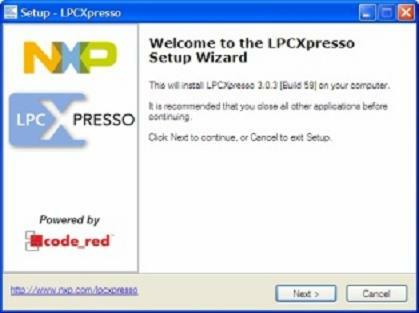 then open http://lpcxpresso.code-red-tech.com/LPCXpresso/ link and login to your account and follow the instructions to download LPCXpresso installer. 3. Select the right Operarting System (OS) and also the latest version. The size is around 417mb at normal broadband speed, its takes few hours to complete download. 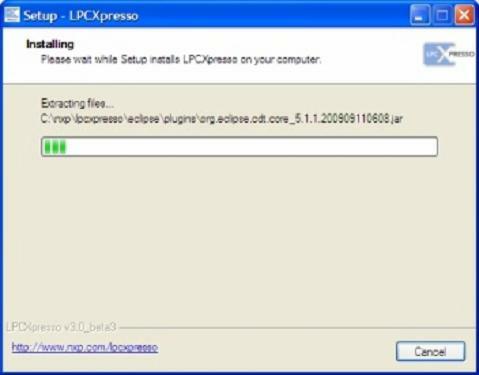 Double-click the LPCXpresso installer file after downloading. Then click "next" on the setup wizard which looks like below. Read the license agreement and then click on the radio button before the text-line "I accept the agreement" (if you accept the agreement). 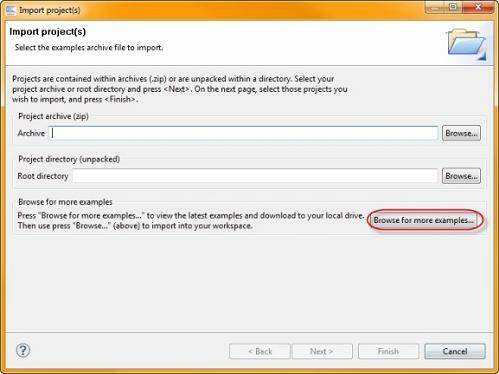 Also Click on the next button to continue installation (in the window appears as shown in the picture below). The below picture will appear for some time before the LPCXpresso installation is complete! should display a web form. After completing the form, you will receive an activation code via email within a few minutes. Highlight the activation code in your email program, and select Copy to place it into the Windows clipboard. Now, choose select Help->Product activation->Enter activation code from within LPCXpresso. Paste the product activation code into the Product activation dialog by right clicking in the Activation code field and choosing "Paste." Then click the "OK" button. You should receive a dialog confirming acceptance of the activation code. 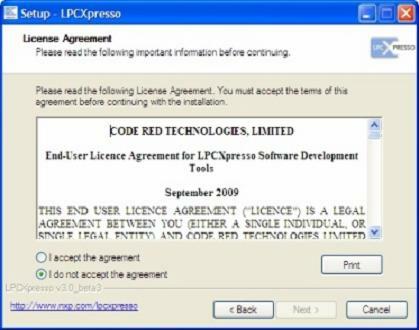 It is also possible to complete LPCXpresso activation on a PC that is offline as long as another PC has access to the Internet. 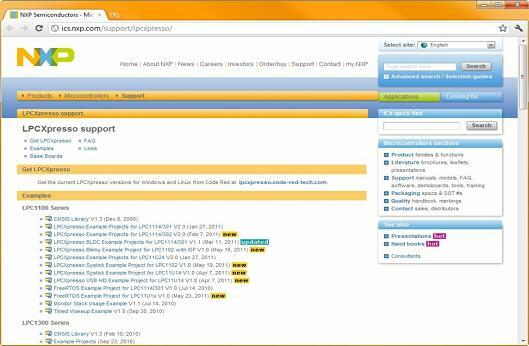 4.1.3 The LPCXpresso-Support web page should appear. 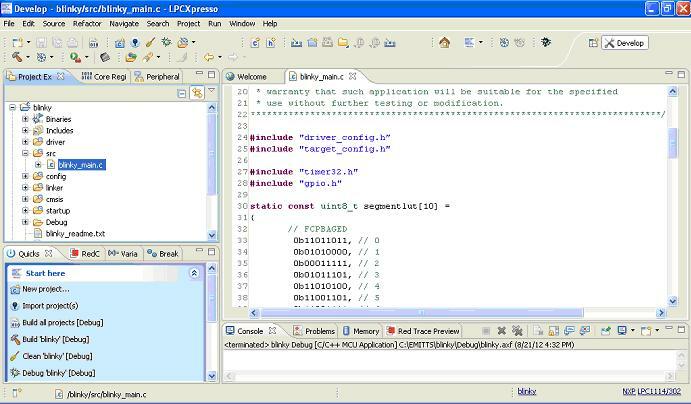 It has links to NXP sample code that has been developed for LPCXpresso. Select the sample code that applies to your Target Device and download it. 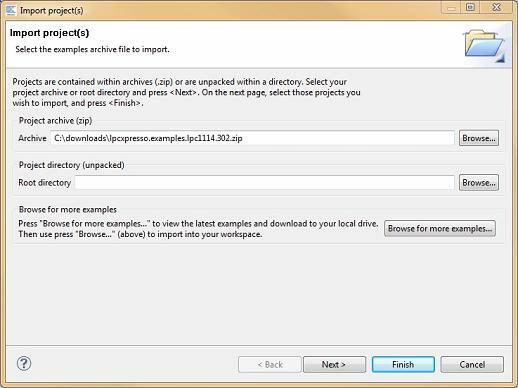 Then, switch back to LPCXpresso and use the Browse button to select the .zip file. 4.1.4 Now click the Next button and then choose which projects to import from the .zip file. 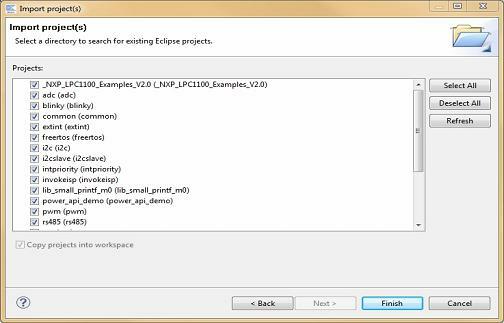 4.1.5 Often, there will be references between projects in a .zip file so it is best to import all of them. 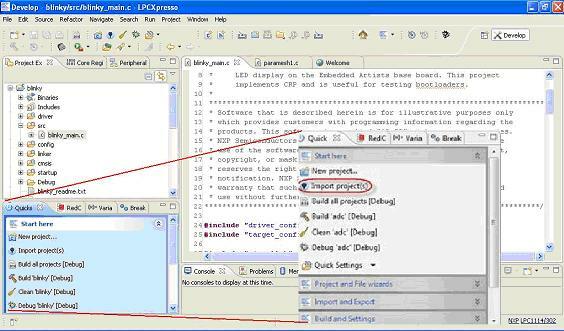 In LPCXpresso, when you start to debug, your program will automatically download to the target and be programmed into flash memory. So before debugging you connect LPCXpresso development board to your PC and install it . 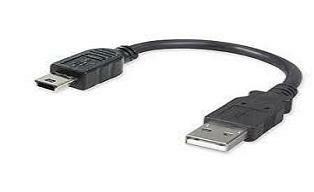 Its very simple, plug one end of the USB cable to PC USB-terminal and other end of the USB cable to the LPCXpresso board. 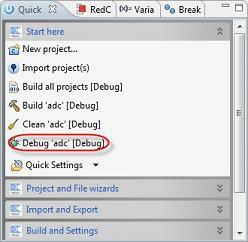 To start debugging on your target, simply highlight the project in the Project Explorer and then in the Quick-start Panel select 'Debug 'Project-name' [Debug]. After debugging, debug toolbar will come automatically as shown in bellow diagram. code running on your target. The debug toolbar will pop up above the code window. Sample programs1: blinking onboard LED . 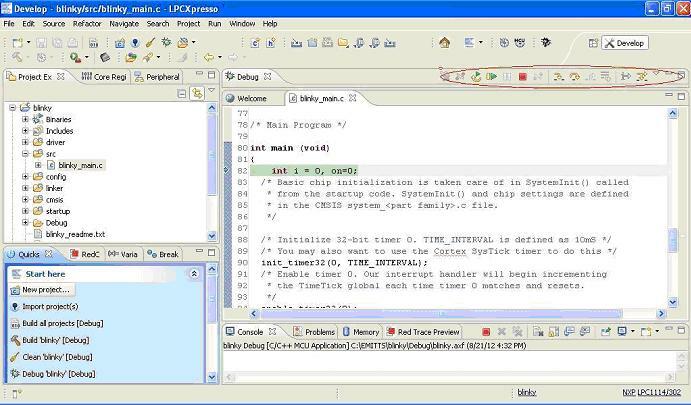 Many such sample programs available in the IDE for you to run. 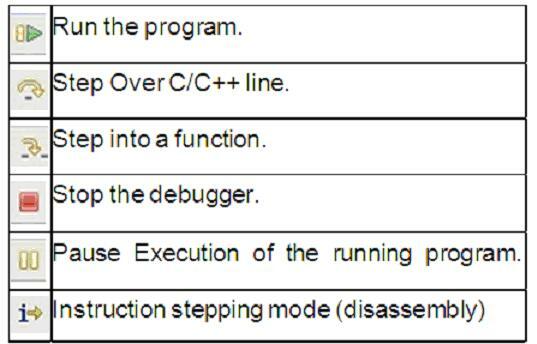 Another sample program is explained in the next module. Module 1: Introduction to Embedded Systems: Definition, application and future. Module 2: Microprocessor, Microcontroller, MCU Manufacturers, introduction to programming. Why engineers going for FPGA rather than ASIC?